Chris Haigh has been playing fiddle professionally for over 30 years, and has amassed a huge experience of different musical styles and genres. He has published three books on fiddle playing, and hosts one of the web’s most comprehensive fiddle sites. ...This is an invaluable treasure trove of information for all fiddlers. His show Fiddling Around The World features fiddle music from across continents and centuries, along with a treasure trove of myths, legends, solid facts and tall tales from the world of fiddling. 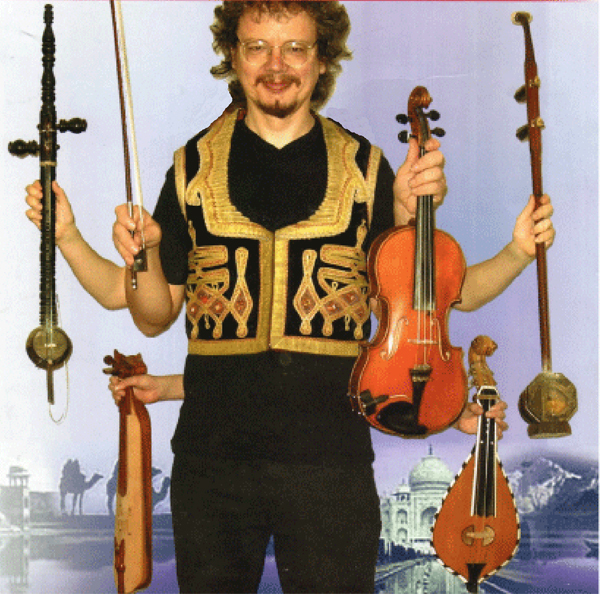 Chris will demonstrate an amazing collection of ethnic fiddles from Africa, China, Bulgaria, Greece and Turkey. You’ll meet the first fiddle player to set foot in America, discover how Mary Queen of Scots escaped from 500 fiddle players, and who really wrote the Orange Blossom Special. You’ll find out where it all went wrong for English fiddle playing at the Battle of Waterloo, and uncover the crimes against music perpetrated by the Soviet dictator Joseph Stalin. You’ll rub shoulders with the Bishop of Galway, and find out why you’re not likely to meet him at a ceilidh. You’ll share a merry tune with Henry Ford and the Ku Klux Klan. You’ll find out how to play on four strings at once, how to cheat at fiddle contests, and how to avoid losing your soul to the devil. Accompanied by guitar and accordion, this lively and richly varied concert is both amusing and informative. 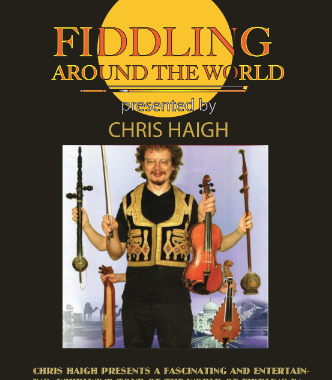 Fiddling Around the World is now available as a 84-page book, published by Spartan Press. It Includes approximately 20,000 words describing fourteen fiddle styles, 48 original and traditional tunes illustrating the styles, and a bibliography of recordings, books and tutors relevant to each style. The book is a unique introduction to the breadth and diversity of the world of fiddling written in a light and entertaining manner from a fiddler’s point of view.